Real live dead shrimps? Sounds purrrrfect! Paws up for the subscription donation! Cat Dancer is one of our favorites, Chey! We hardly ever get real live dead shrimps. Momma is allergic, so she never buys any shrimps. We have to be patient for our Grampy to drop some when our Nana is not looking. srsly. Good thoughts, Chey. That is very generous of you and your human with the donation. That is just great about the donation. We love our fevvers and we have never been lucky enough to have any shrimp. Bet that would be good eating. Hope all of you have a fun day. That Max sure is lucky to get live dead shrimps. We don’t think we’ve ever gotten any. We feel deprived. Good job on that donation, too, Chey! We know Max’s woman will appreciate it! OMC! Fevver wand toys are our favourite! Your mama is sooo nice, AND she brings you shrimps or fishy flakes or what ever you ask for, right? Fangs for your visits to our bloggie…we will nefurr catch up, hahameow! That is so cool! Shrimps is also darn cool! We love fev-vers and Real Live Dead Shrimps!!! Hooray for the generous donation! I never had real live dead shrimp. But I sure do WISH to have some. Um, Mommeh?…. Real live dead shrimps, huh? Now that I have to see for myself! You are a generous cat, indeed, and kudos to you for teaching your human to be the same. That is a nice generous donation! I love to play wif my mama. She throws the bouncy ball for me and I chase it. Then she has to go retrieve the ball so she can throw it again. We both get moving! We like our treats dead or alive. 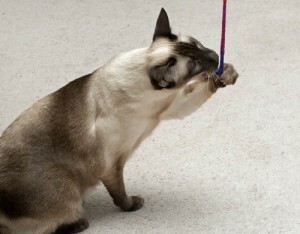 My meezer Merlin wants to ask Chey: do you agree that Siamese cats are smarter? Proper training is important. I hope you get your real live dead shrimp. You are wise indeed, Cheysuli! Great words of wisdom Chey!